The population of older adults within the United States is growing rapidly, which calls for increased understanding of that population. However, ageism is pervasive and one of the most engrained forms of prejudice. Intergenerational service-learning may be one way to reduce negative stereotypes and ageism. The Co-Mentoring Project is an intergenerational service-learning project that matches undergraduate students and vital older adult volunteers. Students meet with their partners at least four times over the course of the semester to conduct a life review and gather information to begin the older adults' memoirs. This chapter provides a rationale for intergenerational service-learning and information about its theoretical underpinnings. The chapter also offers information about service-learning best practices, including structured reflection, and how the Project's methodology is consistent with them. The multi-modal assessment conducted for the Project and its outcomes are discussed. Finally, directions for future research are described. A credit-bearing, educational, experience in which students participate in an organized service activity that meets identified community needs and reflect on the service activity … to gain further understanding of course content, a broader appreciation of the discipline, and an enhanced sense of civic responsibility (p. 112). 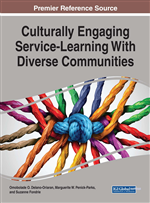 Academic service-learning focuses on the synergy of service and learning (Howard, 1998). Similarly, Jacoby (1996) described the hyphen in service-learning as symbolizing the “symbiotic relationship” between service and learning which bear equal weight in the experience (p. 5). Service and learning are reciprocal- service experiences enlighten and transform academic learning, and academic learning enlightens and transforms service experiences (Howard, 1998).